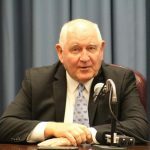 U.S. Ag Secretary Sonny Perdue says he’s extremely disappointed in the decision. “It’s a move that will have a devastating impact on global agricultural production,” he says. Perdue says the USDA has shared scientific studies on the safety of glyphosate with the Vietnamese Ag Ministry on numerous occasions. The studies come from the Environmental Protection Agency and other internationally-recognized regulatory bodies and they all show glyphosate as unlikely to be a carcinogenic threat to humans. He says the decision by Vietnam flies in the face of all the available scientific evidence. Vietnam has sidestepped its obligation to notify the World Trade Organization of the regulatory change. “Vietnam also needs to look at the potential ramifications for its own farmers,” Perdue adds.